If you’re using an HD TV as a client monitor, you’re probably familiar with the dreaded “out-of-sync-on-the-big-screen” problem. This is the result of the fact that most consumer-level TVs introduce a video delay — the time it takes the TV’s video scaling hardware to do it’s job. If you use the same TV at home, you’ll be listening to audio through the TV — and the TV contains hardware that delays the audio, as well, and keeps you in sync. But when such a TV is used in an editing room, audio is typically run through a mixer and big speakers and isn’t delayed. The result is a sync problem on the TV — the Avid’s composer window looks good, but the on the big screen audio is advanced relative to video, often by as much as two frames and sometimes more. What to do? You typically have two choices: run your audio through the TV and then back out to your speakers, or purchase and use an audio delay box. Neither approach is ideal: running audio through the TV is awkward, limits you to two tracks, and may degrade quality, and delay boxes are fairly expensive. 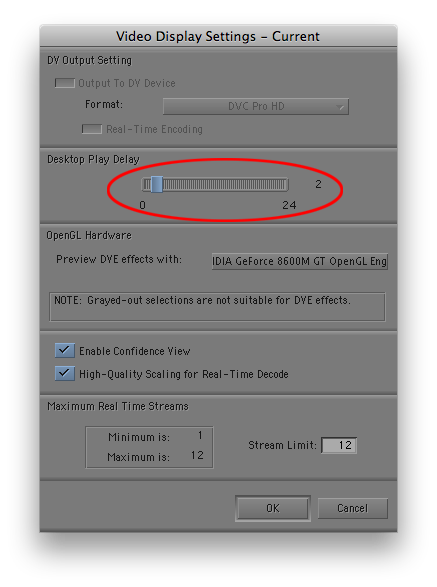 But there’s a third alternative that I discovered recently: Avid’s Desktop Play Delay setting. It was designed for output to a DV device where video and audio are delayed by the latency in the device. But it can also work effectively to put your Avid audio in sync with a client monitor. Just select a frame offset in the setting panel: the number of frames you enter is the amount audio will be delayed. You’ll have to experiment a bit to get it right: on our LGs, a two-frame delay seems best. Sadly, you can’t be in sync on both the Composer window and the big screen, so you’ll have to choose — no delay for perfect sync on the Composer, or your preferred offset for perfect sync on the client monitor. I tend to leave the setting at zero when I’m working alone, but make the adjustment when I have people in the room, or when we’re screening. Also note that because this feature was designed for DV, it causes video to jump when you press play or stop, by the number of frames you’ve selected. That’s not a show stopper, but it’s another reason to set the delay back to zero for the bulk of your work. There’s another quirk, as well: You can’t create two settings panels, one with an offset and one without, and then switch between them. For some reason, whatever you do to one panel affects the other. But despite these problems, the Desktop Play Delay setting has solved a big problem in my cutting room. And if video didn’t shift on play and stop, I might leave it on all the time. This entry was posted on September 15, 2010 at 7:14 am and is filed under Audio, Avid, Avid Technical Tips. You can subscribe via RSS 2.0 feed to this post's comments. You can comment below, or link to this permanent URL from your own site. It’s cool for us, and solved a big problem, appreciate.